Downspouts are commonly directly connected to the sewer system. The cumulative effect of thousands of connected downspouts can greatly increase the volume of stormwater entering the sewer system. 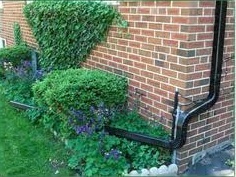 Downspout disconnection is the process of separating roof downspouts from the sewer system and redirecting roof runoff that has been collected in gutters and piped directly to streets, storm drains, and streams and redirects it away from impervious surfaces to landscaped areas, most commonly a lawn. As the runoff is redirected onto pervious surfaces such as vegetated areas, the amount of directly connected impervious area is reduced and this provides the potential to reduce the runoff volume and to filter out pollutants. Simple downspout disconnection requires a minimum flow path length across the pervious area of 5 metres to ensure that all of the stormwater from the disconnected downspout can be captured and infiltrated on your property. When the infiltration rate of the soil in the pervious area is less than 15 mm/hr (i.e., hydraulic conductivity of less than 1x10 -6 cm/s), the area should be tilled to a depth of 300 mm and amended with compost to achieve an organic content in the range of 8 to 15% by weight or 30 to 40% by volume. See Downspout Disconnection brochure. Inlet inspection 2-12/year Inspect periodically for clogging (failure to drain). Remove any accumulated leaves, organic materials, and sediment as soon as practical if an inspection reveals clogging. Mowing Periodically Maintenance is similar to other landscaping and may require occasional mowing. Miscellaneous upkeep Periodically Related maintenance activities are primarily focused on the areas designated to receive stormwater runoff. Infiltration areas should be routinely checked to ensure that they are free of debris and trash. Receiving areas should be inspected for signs of channelized flow and signs of compaction. Property owners can disconnect downspouts themselves at a relatively low cost (about $50) with a few tools and supplies (for example, a cap in the standpipe with a hose clamp, an elbow and extension, and a splash block).